WASHINGTON — Employee firings at the Department of Veterans Affairs jumped in the second half of 2017 after new accountability legislation was signed into law last summer, results that administration officials insist show a renewed commitment to cleaning up the agency. But critics say more firings don’t mean better results for veterans, and the rising rate of dismissals may not be significantly different than past years for the massive government bureaucracy. “I don’t think this has accomplished what they want it to accomplish,” said Marilyn Park, legislative representative for the American Federation of Government Employees. 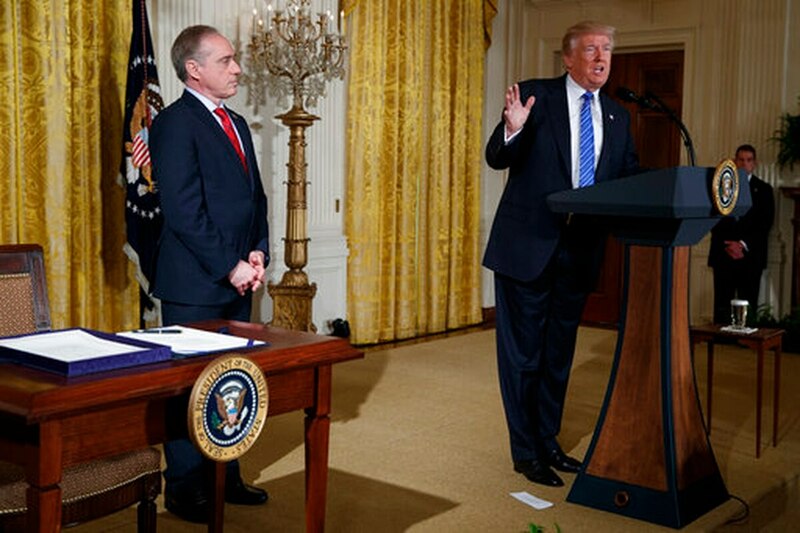 In June, President Donald Trump signed into law the Veterans Affairs Accountability and Whistleblower Protection Act, legislation he has subsequently touted as one of his biggest accomplishments during his first year in office. Among other provisions, the legislation shortened the appeal time for VA employees protesting their dismissals and expanded VA leadership’s ability to remove most workers, including senior executives, for misconduct or poor performance. From February to the end of July — before the new rules were put in place — 566 VA workers were fired (an average of about 94 a month). From August to mid-December, that figure rose to 756, or about 168 a month. VA officials called that a sign of progress. “The (legislation) is one of the most significant federal civil service reforms in decades and is helping instill across the department the type of workforce accountability veterans and taxpayers deserve,” VA spokesman Curt Cashour said in a statement. The current VA administration is the first to publicly post specifics of employee firings online, a move officials said would help transparency and accountability. The difference in how those reports were handled in the past make exact comparisons for firing rates difficult. But even with the recent increase, the total number of firings at the 300,000-plus-person department appears to be in line with past years. In 2015, then VA Secretary Bob McDonald said about 1,500 employees were fired from the department, an average of about 125 individuals a month. In fiscal 2013 (which ran from October 2013 to September 2014, including the VA wait time scandal of spring 2014) department records indicated that more than 2,200 employees were fired, an average around 183 a month. Eight senior VA leaders were dismissed in 2017, four before the new law was put into effect and four after. On the year, 38 physicians were fired, with 23 of those coming after the new law. The bill will speed up firing rules for everyone in the 350,000-employee department. Nurses and nursing assistants (226 fired) and housekeeping aides (159 fired) had the top dismissals by position in yearly figures posted just before the Christmas break. Cashour said the smaller number of senior employees hit by the new law is not indicative of problems in its implementation. But officials from AFGE, the largest federal employee union and a vocal critic of the new accountability law, said they believe the new firings have largely focused on those lower-level workers. They have requested more detail on management firings and suspensions for 2017, but so far have received no answer.